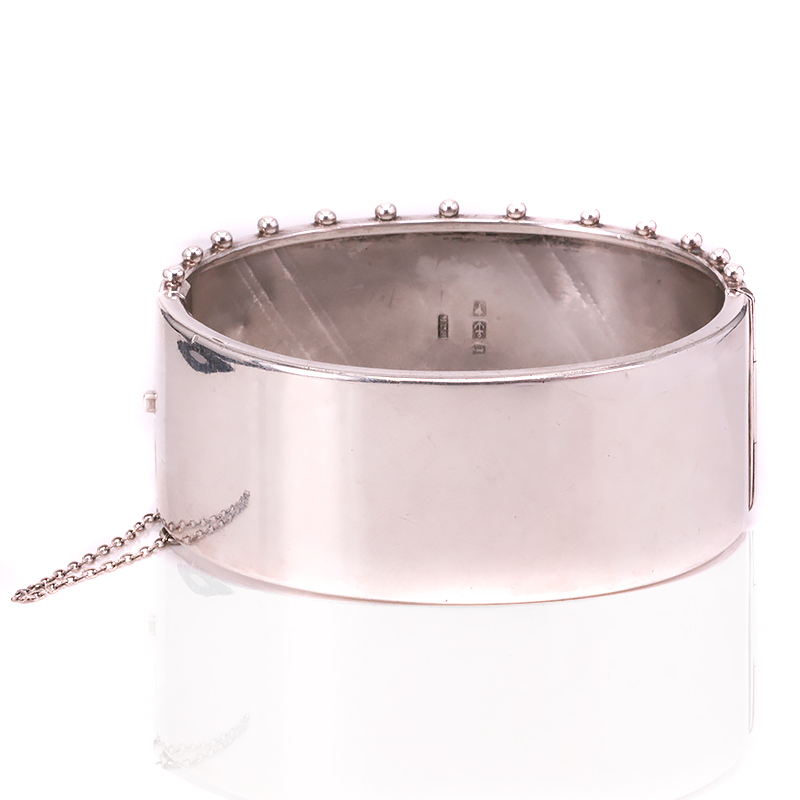 Product code: ES8168 Categories: Sold Items, Sold Jewellery. 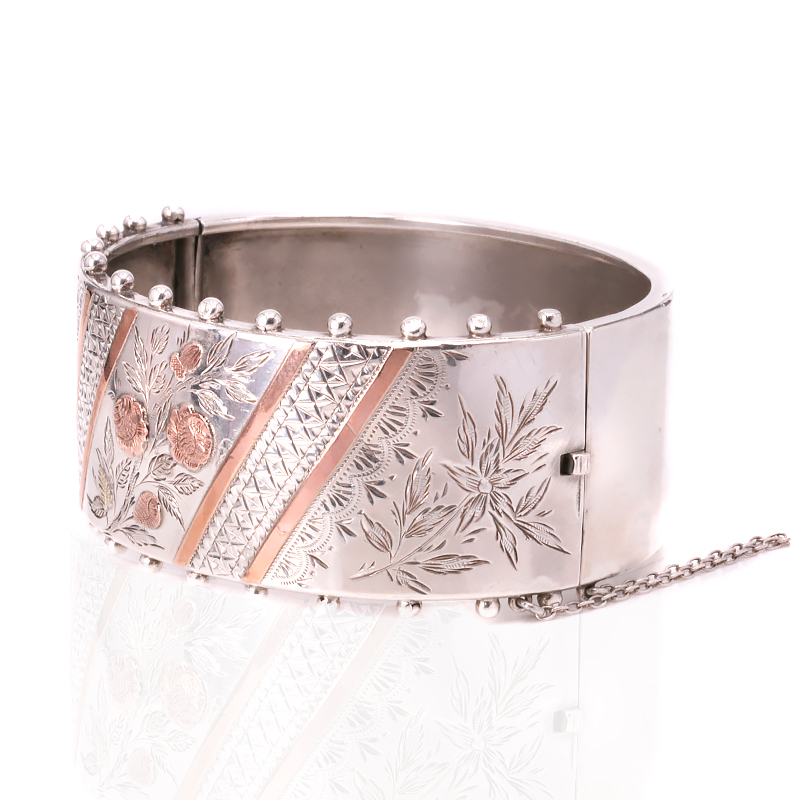 Here is a fabulous antique sterling silver bangle with rose and green gold that looks spectacular on the wrist and is destined to always be admired every time it is worn. Made in 1885, this alone is a testament to the quality of jewellery that was able to be made over 130 years ago and is just one reason why there is nothing like a genuine antique piece to own and wear all the time. Measuring 26.8mm wide including the balls along the edge, the bangle has the most delightful floral motif which is highlighted by both rose and green gold. Rose gold is still found today, however green gold was only used for such a brief time in the late Victorian era. With a delicate and light soft green hue to it, it emphasises the leaves in the bangle. With all of the detail being hand engraved, the quality of hand engraving is always so much finer and more detailed than machine engraving or pieces that are simply stamped out. Being hinged will allow this bangle to sit nice and close to the wrist and it is also fitted with a safety chain for added security and no matter the occasion or time of day or night, this is such a wonderful and exciting antique bangle from the Victorian era. Tag: Antique sterling silver bangle.